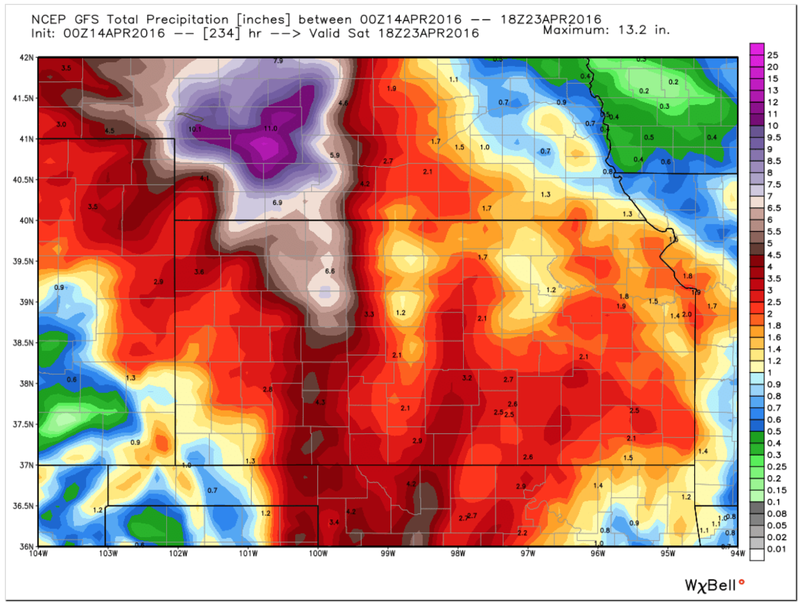 Here is what the U.S. GFS model's 10-day rainfall forecast for the Kansas region looked like from the model run from data through 1pm this afternoon. Here is the same period (only 9.7 days) forecast from this evening's model run. The new model run (which benefits from the inclusion of worldwide upper air balloon launches) is considerably wetter than the run from six hours earlier. So much so that flooding -- even with the recent dry conditions -- becomes a consideration. Yes, that is a tiny area where 13 inches is forecast over ten days in southwest Nebraska. Hopefully, the models are correct that the rain will be spread out over a number of days so flooding can be minimized. Without criticizing other meteorologists, there was a TV station in Wichita that downplayed the potential for heavy rains during their 6 o'clock newscast this evening. I disagree. 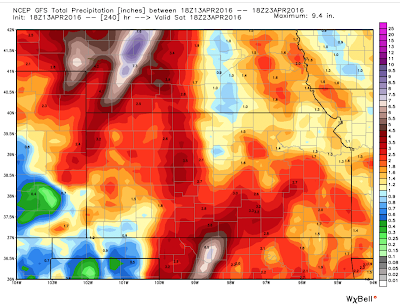 Everything I see, outside of northeast Kansas, indicates substantial rains, perhaps excessive rains in some locations, over the wheat belt the next ten days.